I find it challenging to write articles about web development without boring you with the nitty gritty of web programming. Chances are you’re a business owner, or are somehow involved in the marketing of the company you work for. You don’t really care how your website is programmed—you just want it to be effective. So let me tell you about something that might be preventing your website from being as effective as it could be: speed. Or rather, the lack thereof. By speed I mean the amount of time it takes for a visitor to download a page of your website. Put simply, fast websites lead to higher visitor engagement, retention and conversions. The reverse is true as well. Slow websites are less effective websites! Right or wrong, people are busier than ever. They are also impatient! Especially so with technology. Visitor engagement on your company website isn’t measured in minutes, but seconds and milliseconds. 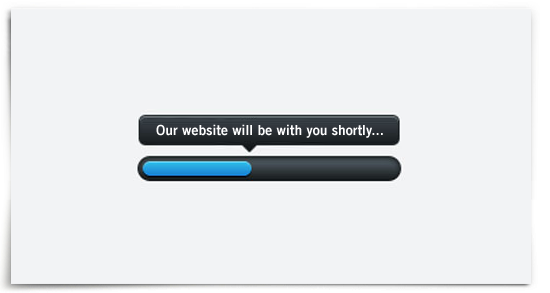 If your website is loading slowly, that may be all it takes for a visitor to leave. On the flip side, if your website is fast, that same visitor is more likely to view more pages and spend more time on your website. Doesn’t high-speed Internet fix this problem? Nope. While high-speed Internet is great, we tend to just download more. Websites are much “heavier” these days, with big graphics, high definition videos, custom fonts and more. In fact, it’s partly because our websites deliver so much more that we have this speed problem. And while there may only be a handful of people still on dial-up connections, there’s a whole new type of slow Internet we still need to consider. Mobile users. Those accessing your website from their phone or tablet using cellular networks. Companies like Google and Yahoo take website performance very seriously as well. Google even uses the speed of your website as a ranking factor! If you login to your Google Analytics account you’ll notice a “Site Speed” report. Why do they do this? Because they are very concerned about user experience. They know that a user visiting a slow website will be more likely to leave it. So, they save them the aggravation by penalizing slower websites. Don’t worry, all hope is not lost. Making a website fast is actually a lot easier than some other parts of a successful website, such as beautiful design, powerful messaging, and engaging content. There are basically two main components of a fast website: 1) good programming, and 2) a good web server. You need a web developer well versed in website performance. There is tons of help online. A great place to start is on the Google “Make the Web Faster” website. Don’t cheap out on your web hosting. Yeah, I’m looking at those of you who are using GoDaddy web hosting. You can have a well programmed website, but if your web server is slow, your website will be slow! Look for a reputable host who is somewhat close geographically to the majority of your website visitors. Meaning, if 90% of your visitors are from Ontario, don’t host your website on a server in California. How can you test if your website is slow? There are plenty of tools you can use online to see how your website is performing. One that I like is from Pingdom.com. Enter your website address, click the “test now” button, and wait for your report. If your performance grade is less than 90 out of a 100, or your load time is more than 2 seconds, your website may be suffering from speed problems. Remember, I don’t have time for your slow website!